I see the pictures, the video, and the news stories, and it is still hard to accept the reality of what happened Sunday morning. For those of you who are not familiar with my town and the events surrounding it, our community suffered a great loss over the weekend by losing much of the high school to a fire. 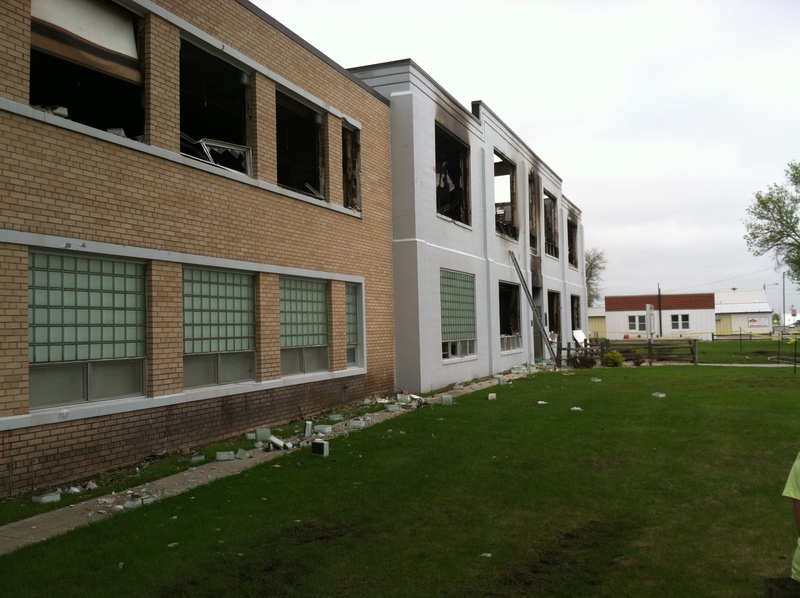 Since I was on vacation when it happened and had to leave directly from that to the Pisces, I never saw the fire or the resulting damage, and I suppose reality will finally sink in three weeks from now when I see my school and classroom in person to see what science materials and equipment is salvageable. My sympathies to those affected by this tragedy. However, I am heartened by my community’s initial response of determination to rebuild our school and to continue our tradition of offering high quality education to rural South Dakota. Though the future remains uncertain, I stand with those who support saving our school district and will be there to help see this transition through. I will proceed with the NOAA Teacher at Sea program while keeping in mind that I am now helping move forward the recovery from this tragedy by advancing and enhancing the future of science education in Hoven and beyond. Back in the Gulf, I flew into Gulfport, Mississippi, on Monday, May 26, and took a taxi to the Pisces in Pascagoula, Mississippi. By chance I met a crewmember who noticed the NOAA Teacher at Sea t-shirt I was wearing at the airport. He too had flown in on the same plane that I had from Atlanta. He was very interesting to talk to learn about many of the diverse backgrounds needed to operate a ship like the Pisces. In our conversation he had talked about why he joined NOAA and some of his past work that had given him the experience necessary for the job. Since he is a crewmember on the deck crew, experience at sea and ship operations is a necessity. The crew allows for day-to-day operations, ensures safety of the ship and the passengers, and assists with the research in its logistics and implementation where necessary. The crewmember I talked to had extensive experience working at sea on cargo ships and looked forward to his future work with NOAA and was very interested in all the science that the Pisces carries out. In general, the crew can be divided up into the following categories: deck crew, officers, stewards, technicians, and engineering. The deck crew carries out the implementation of operations and day-to-day maintenance of the decks. The officers are members of the NOAA Corps, one of seven uniformed services of the United States. The stewards maintain the galley (kitchen) and mess (dining room) providing meals to everyone on the Pisces. The technicians process data and maintain data collection systems and other electronics. Engineering operates and maintains the ship’s engines, equipment, and various electrical and operational systems. Whether it is the deck crew, officers, stewards, technicians, or engineering, all are needed to make the science carried out by the science party possible. 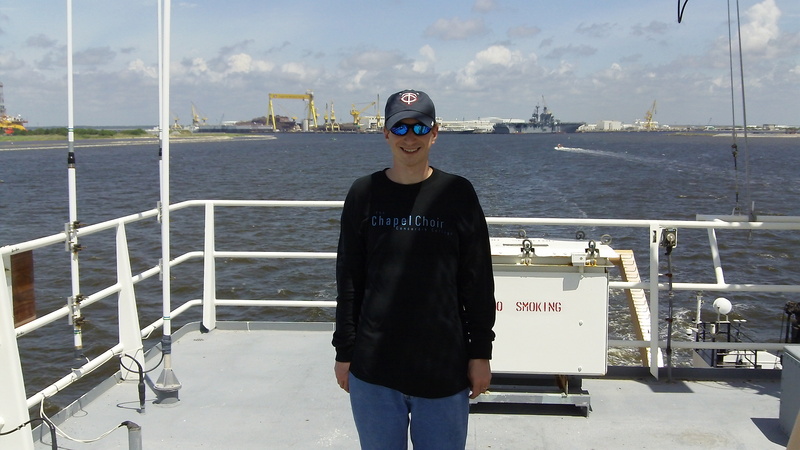 A picture of me on the top deck of the Pisces as we leave Pascagoula, Mississippi, for the Flower Gardens off the coast of Texas. The USS America is in the background. Credit Harriet Nash for the photo. I arrived at the Pisces during the afternoon on the 26th. This was very helpful in giving me some time to explore the area in Pascagoula and the ship before takeoff the next day. I was assigned a very nice stateroom that I am sharing with another member of the science party. I was surprised that our accommodations were so spacious. We get our own desk, tv, sink, bathroom, and shower. It reminded me of living in the college dorm my freshman year minus the group showers; so, I was more than pleased with the living arrangements. Looking around Pascagoula directly adjacent to where the Pisces was docked, I was amazed at all of the heavy industry concentrated around the Pascagoula River. The river hummed with activity day and night with trains, cargo ships, tugboats, oil and gas well repair work, ship repair work, fishing operations, and tourism. It was quite remarkable to see where some of the goods that we buy in stores back in South Dakota first make their landing on the North American continent and to get a sense of the scale of the sea-based operations needed to make international trade possible. The ocean is how you are able to sell your beans to Brazil or wheat to China. It is the economical lifeblood that connects all of us, but we seldom think of what happens to our goods beyond the retail store or the elevator. We just know the system works and take the infrastructure behind it for granted. Though South Dakota is more than a thousand miles from the Gulf of Mexico, it is linked by trade with the rest of the world through the Gulf. 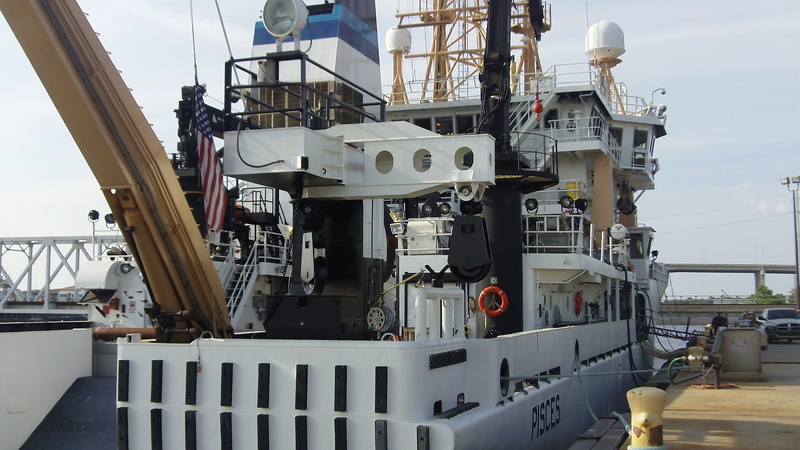 The NOAA ship Pisces is a state-of-the art research vessel. Even when in transit to a specific operational location, it is always recording data and making observations of the ocean and the atmosphere. Onboard the ship I was able to explore the different decks. The Pisces is a large ship, but it is not until you move around on the decks that you realize how much space is needed to carry out all of the diverse series of scientific operations. The Pisces is equipped with a hydraulic crane with the ability to lift 10,000 pounds, which is needed to raise and lower science equipment and remove and replace the gangway, the walkway needed to board and get off the ship while it is docked. The ship also has a giant spool called a net reel where they store the fishing nets used for trawling missions and a series of winches with thousands of feet of wire to lower scientific instruments into the depths of the ocean. Even when the Pisces is not carrying out any specific operations while in transit to an operation point, the ship is utilizing every opportunity to gather data on the ocean and the atmosphere. 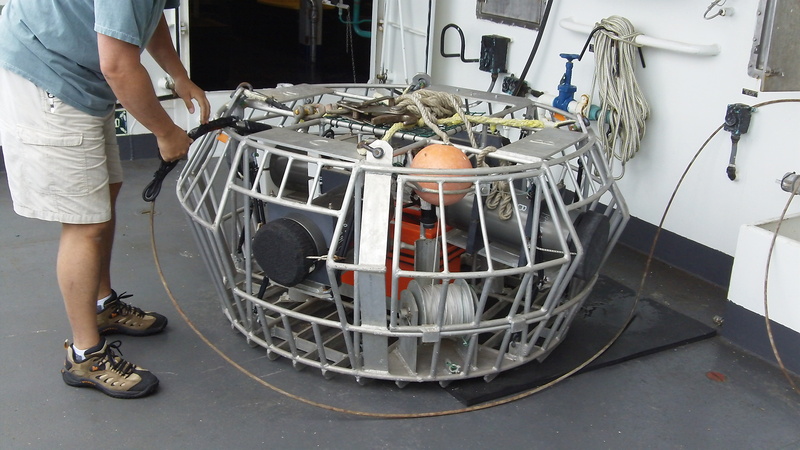 The Pisces is specifically designed to run quietly to allow for state-of-the-art acoustic sensors to gather information on topographic features of the bottom and even information on various types of biomass in the water column such as fish, plankton, and the different types of coral on the ocean bottom. The ship is also always taking meteorological readings for scientific use, calibration, and navigation. Wind speed, wind direction, relative humidity, water temperature, barometric pressure are just some of the observations that are constantly being compiled; therefore, even in the dead of night in our transit, the Pisces is carrying out valuable scientific research and monitoring. We are enroute to the Flower Gardens, one of the northern most reef forming corals in the world. In fact, the Flower Gardens were not officially documented to have extensive coral reefs until the early 1960s when researchers started to investigate rumors of coral reefs in the northern Gulf of Mexico. What research divers found was amazing: a pristine coral reef not touched by poaching or pollution. We are scheduled to arrive at the reefs this evening, May 28. We will begin the fish surveys using the camera array and bandit reels tomorrow, as well, to document fish populations among the coral reef structures. One means of surveying fish abundance and size is using this submersible camera array. It is equipped with four cameras that are used for random sampling for survey data. The array is fitted with a bait bag filled with squid in order to attract fish such as grouper and snapper. The world’s coral reefs contain a remarkably rich and diverse multitude of life, yet they are threatened by poaching, pollution, disease, invasive species, and increasing ocean temperatures and acidity.